Penelitian - NASA's MarCO mission was built to see whether two experimental, briefcase-sized spacecraft could survive the trip to deep space, and the two CubeSats proved more than able. After cruising along behind NASA's InSight for seven months, they successfully relayed data back down to Earth from the lander during its descent to the Martian surface on Monday, Nov. 26. Nicknamed "EVE" and "WALL-E" after the stars of the 2008 Pixar film, MarCO-A and MarCO-B used experimental radios and antennas, providing an alternate way for engineers to monitor the landing. The CubeSats provided information to InSight's landing team in just 8 minutes -- the time it took for radio signals to travel from Mars to Earth. That was much faster than waiting on NASA's Mars orbiters, which weren't positioned to be able to observe the entire event and send data back to Earth immediately. "WALL-E and EVE performed just as we expected them to. They were an excellent test of how CubeSats can serve as 'tag-alongs' on future missions, giving engineers up-to-the-minute feedback during a landing," said MarCO chief engineer Andy Klesh of NASA's Jet Propulsion Laboratory in Pasadena which built the CubeSats. Landing on Mars is exceptionally difficult: Before InSight, only about 40 percent of all attempts by various nations had succeeded. Even if a spacecraft doesn't survive landing, having a "black box" -- or a pair of them, as with MarCO -- to record the event can help engineers design better landing technology. 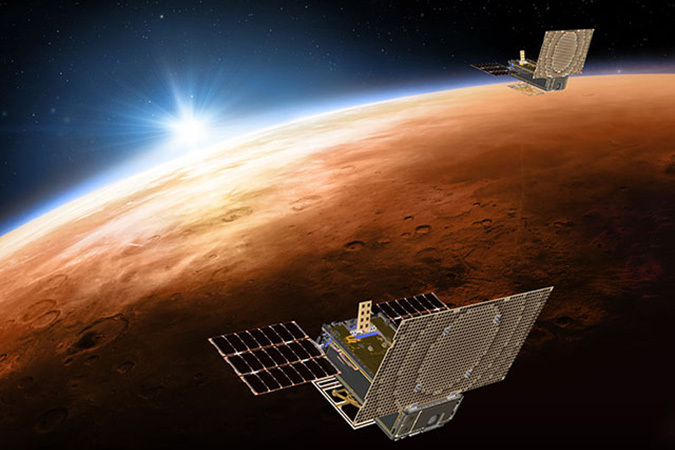 Neither of the MarCO CubeSats carry science instruments, but that didn't stop the team from testing whether future CubeSats could perform useful science at Mars. As MarCO-A flew by, it conducted some impromptu radio science, transmitting signals through the edge of Mars' atmosphere. Interference from the Martian atmosphere changes the signal when received on Earth, allowing scientists to determine how much atmosphere is present and, to some degree, what it's made of. "CubeSats have incredible potential to carry cameras and science instruments out to deep space. They'll never replace the more capable spacecraft NASA is best known for developing. But they're low-cost ride-alongs that can allow us to explore in new ways," said John Baker, JPL's program manager for small spacecraft. "WALL-E sent some great postcards from Mars! It's been exciting to see the view from almost 1,000 miles (1,600 kilometers) above the surface," said Cody Colley of JPL, MarCO's mission manager, who led the work to program each CubeSat to take images. With the mission's objectives reached, the MarCO team will spend the next couple of weeks collecting additional data on each CubeSat. Of interest will be how much fuel is left in each CubeSat and detailed analyses of how their relay capability performed. There's also sure to be more celebrating among the team. "MarCO is mostly made up of early-career engineers and, for many, MarCO is their first experience out of college on a NASA mission. We are proud of their accomplishment. It's given them valuable experience on every facet of building, testing and operating a spacecraft in deep space," said Joel Krajewski of JPL, MarCO's project manager.